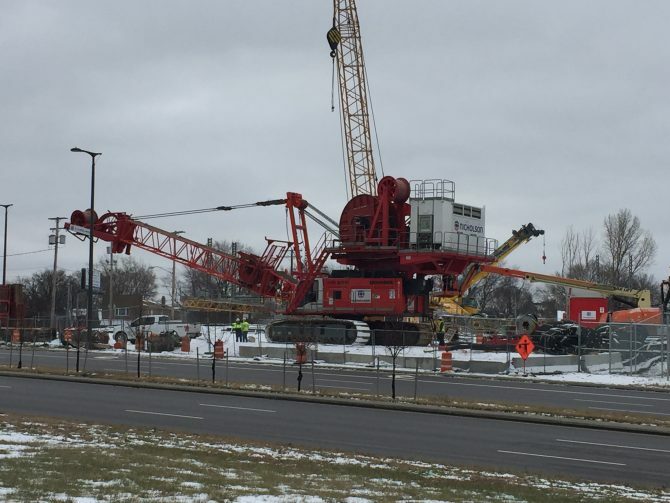 Cleveland (January 14, 2019) – Starting today, West Shoreway drivers will see an unusual site – a large machine used for constructing large-scale sewer tunnels. The machine, called a hydrofraise, is used in the excavation of rock and soils. Assembly should be complete by Wednesday or Thursday. Shaft 2 is located near the intersection of W. 45th St. and Tillman Ave, south of The Shoreway and immediately west of The Harp on Detroit Ave. Known as WST, the Westerly Storage Tunnel Project is one part of Project Clean Lake, the Sewer District’s $3 billion, 25-year program to control the amount of raw sewage discharged into area waterways during heavy rain. Project Clean Lake will reduce combined sewer overflow (CSO) from 4.5 billion gallons to 500 million gallons by 2036. As part of Project Clean Lake, WST, specifically, will help control overflows at two locations along the Cuyahoga River and reduce combined sewer overflow pollution to the environment by 328 million gallons per year.